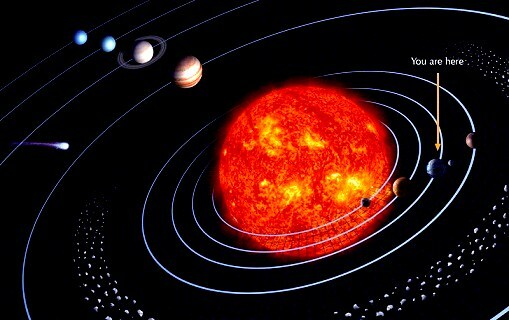 In our solar system, Sun is situated in the centre with nine planets revolving around it : Mercury, Venus, Earth, Mars, Jupiter, Saturn, Uranus, Neptune and Pluto. In Jyotish we generally don’t use Uranus, Neptune or Pluto however there are many modern astrologers who have incorporated it into their work. Also in Jyotish we use the nodal points of the Moon. The ascending node we call Rahu and the descending node we call Ketu. In Jyotish we also include the Moon as a planet even though it isn’t regarded as a planet, but a satellite of the earth. Sun is the closest star to Earth. Its distance to earth varies between 14 7 103,000 km and 152,106,000 km away. It is 109.3 times that of the Earth’s diameter. It is a mass of gases and coverts hydrogen to helium at temperatures of around 2, 7000,000 degrees Farenheit which releases tremendous amounts of energy. Its rotation period at equator is 26.9 Earth days and at its poles is 31.1 Earth Days. The earth goes round the Sun once every 365 days which is our solar year. We cannot live without the Sun. It is responsible for daylight, for sustaining life on the planet and its importance has been worshipped by all ancient and modern civilizations. In Jyotish, Sun being a hot planet rules over things like anger, leadership, masculine assertiveness and power. It also rules the soul. Moon is a solid mass and appears spherical. It is approximately one quarter the size of earth and one sixth of Earth’s gravity. It is earth’s only satellite. It is close to earth with a mean distance of 384,000 km. It is covered with craters, mountains and valleys and has weak gravity and almost no atmosphere. It takes approximately 28 days to rotate on its axis and roughly that to also orbit the earth . The period between the full Moon and next full Moon is called the synodic or lunar month and is 29.5306 days. We only see one face of the Moon and its shape appears to change due to the amount of light shining on it depending on the relative positions of Sun-Earth-Moon. The new Moon and full Moon are particularly important times in Vedic Astrology. In Astrology Moon governs our emotional and psychological psyche and represents the feminine mother energy. Mercury is the closest planet to the Sun and smallest planet in the solar system. It is a planet of extreme temperatures with a very dry, hot and almost airless atmosphere. Its mean distance from Sun is 58,000,000 km. Because it is close to the Sun, it is difficult to see most times. Mercury moves around the Sun faster than any planet. It travels about 48km per second and takes around 88 days to orbit the Sun. It is nearest to Earth after 116 days which is known as the synodic period of a planet. Mercury rotates once every 59 earth days. Its slow rotation on its axis and rapid movement around the Sun means that one day on Mercury is the equivalent of 176 Earth days. Mercury is the second densest major body in the solar system after Planet Earth . Mercury’s smaller mass makes its force of gravity only about a third as strong as that of the Earth. An object that weighs 100 pounds on the Earth would weigh only about 38 pounds on Mercury.In Astrology Mercury among many other things represents agility, intellectual acumen, lightness and flexibility. Venus is the second closest planet to the Sun next to Mercury. It is the brightest natural object in the night sky besides the Moon. It takes 225 earth days to revolve around the Sun and undergoes phase changes similar to the Moon. Venus is very special to the ancients and the Mayans based their calendar on it. It is smaller than earth and one venus day (rotation on its axis) is equivalent to 243 earth days. In Astrology it is the planet of arts, love and beauty. It is the guru of Asuras and represents goddess Laxmi in the vedic pantheon. Earth is the third planet from the Sun. Its diameter is 12, 800 km. 71% of the earth is covered in water and its atmosphere is mainly comprised of nitrogen. The earth spins on its axis once a day relative to the sun, which is equal to 24 hours 3 min 57 seconds. This is called the solar day or synodic day of Earth. The sidereal day relative to the stars is 23 hours 56 min 4 seconds. The earth takes 365.25 days to revolve around the Sun. The earth has another motion related to its axis known as precession of the axis. This motion is of great importance to Vedic Astrologers who measure it to construct the horoscope accurately. Mars is commonly referred to as the ‘red planet’ because of its surface composition of iron oxide and it is 4th in distance from the Sun. Mars is about 230 million km from the Sun and it takes Mars 687 earth days to revolve around it. Mars rotation on its axis takes around 24 hours and 39 minutes. Mars is about half the size of earth and has two Moons. In Astrology Mars is the planet of war. Jupiter is the most massive of planets. It is the only planet besides the earth which has a magnetic field. The planet’s surface is made up of liquids and gas. It is more than 11 times larger than earth and has over 63 Moons. It is approximately 466 million miles from the Sun. It takes 9 hours, 55 minutes to rotate on its axis and 12 earth years to rotate around the Sun. In Astrology Jupiter is a planet of expansion, growth, joy and learning. It is considered the guru of the gods and a protective beneficial force. With the exception of Uranus, Neptune and Pluto Saturn is the outer most planet. Saturn is made up of mostly liquids and gas. Saturn has unique rings around it comprised largely of billions of ice particles. It takes 29.46 years for Saturn to complete a revolution around the Sun (its sidereal period). This cycle is of great importance in Astrology and usually signifies very final or fated changes in one’s life. It takes Saturn 10 hours, 40 min and 24 seconds to rotate on its axis. Saturn is said to have around 31 Moons. It is about 10 times larger than Earth. In Astrology Saturn is considered to be a cold and remote planet and rules unpleasant things like separation, old age, death and destruction. These are not planets in real terms but points where the orbit of the Moon crosses the ecliptic (ie. the apparent path of the Sun across the heavens against the background of the stars). The ascending node is called Rahu and is where the Moon crosses to the north of the ecliptic. The descending node is called Ketu and is where the Moon crosses to the south of the ecliptic. The nodes are very important in Astrology and are considered to be the main karmic control planets in a chart, the north node governing future karmas and the south node governing the past karmas. Solar eclipses occur when the new moon is near one of its nodes. When the full moon occurs at the same position at the node, a lunar eclipse can occur. This entry was posted in Jyotish Writings by Veno and tagged astronomy, ecliptic, jupiter, jyotish, ketu, lunar eclipse, mars, mercury, moon, rahu, saturn, solar eclipse, sun, venus. Bookmark the permalink. What Makes A Good Astrologer?